Community, in the policy context, is defined on the basis of fixed in place socio-political unit having residential proximity to the resource or according to state recognized political units. With the boundaries drawn at the village level and the custodial rights of the common lands vested with various departments of the state, it is difficult on the part of the communities to manage such resources. With the advent of participatory forest management powers have been devolved to the communities for protection and use of the resources. Apart from the institutions at the village level, many of the discussions in recent times have focused on the need for nested institutions at various levels to help conserve and protect large landscapes. The need for nested institutions emerges to resolve conflicts and work towards reshaping the boundaries to establish stable governance of the resource. Despite the regulated use of the resources by community institutions, the resources have tended to get degraded gradually. Conservation of large landscapes requires mechanisms to bring in equilibrium the demand and supply within and among the communities in the larger socio-political setting. These institutions in many circumstances feel incapacitated to understand the entire landscapes and assess the quality and the availability of the resources and therefore take decisions based on the "who is right" and not "what is right". The protection and use posits a need for "means" to understand the entire resource base to take decisions effectively. Geographical Information System (GIS) technology is one of the widely used tools to assist in the management of larger landscapes in terms of forest conservation, pastures, water resource management and wildlife management. The integration of both spatial and non-spatial data allow users to efficiently and effectively make well-informed decisions using visual aids and three-dimensional models that simulate the environment. This paper discusses a participatory Geographic Information System (GIS) with community forest management groups in India and the importance of 'putting people before technology' in order to make GIS a truly participatory process in landscape management. The process of dialogue can lead to better information and more transparency about community needs, strategies and the problems at stake. Keywords: Community; land management; Geographical Information System; nested institution; India. Community management of forests and grazing lands in India has gained momentum since 1980s through various programmes launched by the State. Typically, the institutions and tenurial rights are based on habitation boundaries or administrative units. The custodial rights on the commons still lie with various Government departments. However, the contiguity of the resources demarcated to various institutions (and communities) and the scale at which ecological processes need to be looked at, say a landscape, imply that the village communities may only be looking at a part of the larger whole. Conservation and the protection of these commons have been facilitated by different agencies at various levels. However, these efforts are often isolated or scattered and do not address an entire landscape. To effectively manage landscapes, there is a need to expand the vision to larger spatial and temporal scales. The work on restoration of ecological processes (example: succession, water regimes, genetic evolution, wild fi re etc.) requires intervention over large spatial and temporal scales. Understanding the underlying ecological processes that drive the ecosystems would help in better analysis for effective management of the landscapes. Further, the dependence of the communities is also not limited to the administrative boundaries but they transect across the landscapes to access particular ecosystem benefits, though the access and the method of transactions may vary. Enforcement of protection and conservation mechanisms across the landscape. It is in such a scenario that GIS offers an opportunity for the community institutions and their conglomerates to better understand and address the above issues by comprehending and quantifying aspects of the resources (biomass, bio-diversity, resource flows etc.) at a scale larger than what they are used to, i.e. at a landscape level rather than within the boundaries of the forests and grazing lands that they are protecting. It also helps in analyzing the trends and changes in the landscape over time, including forecasting based on the past and imminent changes. This information base enables the communities to make realistic and accurate assessment of the status of the resources and accordingly decide the use regime - in a real sense - gain control over their resources and lives. The meso level analysis can provide inputs for governance of commons at the village level through quantification of resource availability and use patterns. Presentation of such information to the representatives of the village and new collectives would enable them to engage with issues emerging out of an analysis of the overall potential and limitations in terms of biomass, biodiversity and water availability and their extraction patterns. Such information would feed into and form the basis for evolving rules and norms for provision and appropriation at a micro and meso levels. The potential for collective action strategies to promote adoption of large-scale technologies and natural resource management practices is generally greater. Collective action institutions may not only facilitate joint resource management, but also include inter-community dialogue and conflict resolution. This is not to say that the association, monitoring and enforcement costs of collective action do not increase with space, but that the coordination costs and efficiency losses of managing large scale resources privately will, up to a certain level or size, often overwhelm other costs, making collective action an economically superior alternative, at least in terms of social costs and benefits. Once a threshold size is reached in terms of the transaction costs of sustaining collective action, a role for the state may be warranted. GIS thus has the potential to bridge the information gap allowing communities to play a critical and informed role in the decision-making processes on commons, particularly at the landscape level. Accurate and comprehensive spatial data play a crucial role in all areas of environmental management and sustainable development. The benefits of appropriate landscape management would far outweigh the costs of setting up and running the GIS database. Providing the information on the status of biomass, bio-diversity, water regime etc. of the landscape to the communities helps in decision-making process in the management of the natural resources. Historically, a community has been defined as a group of people who share similar beliefs and customs and who live in the same area. Among the oldest and most basic of institutions, the community perhaps ranks second only to the family. Members share a sense of connectedness - of belonging, mutual obligation and identity. They are linked by economic, social, and emotional relationships. These connections and relationships are not owned or controlled by individual community members; but are held by the community "in common" - owned by all to be shared equally by all. The essence of true community is embodied in the "community commons" (Irked 2003). Most rural communities are characterized by a strong sense of place; these communities draw as much a sense of identity and connectedness through their geographic location as they do through their relationships with each other. The sense of place usually comprises of and is defined by the landscape, the climate and sometimes even the location in relation to surrounding regions and areas. However it is the landscape comprising the forests, lakes and farms that primarily gives the community its sense of belonging and security. "The land," like the connections or bonds among people within a community, is distinguished by its contributions to the "common good." Community, in the policy context, is defined on the basis of fixed in place socio political unit having residential proximity to the resource or according to state recognized political units. With the boundaries drawn at the village level and the custodial rights of the common lands vested with various departments of the state, it is difficult on the part of the communities to manage such resources. With the advent of participatory forest management powers have been devolved to the communities for protection and use the resources. Apart from the institutions at the village level, many of the discussions in recent times have focused on the need for nested institutions at various levels to help conserve and protect large landscapes. There is evidence that communities across the country have made efforts to protect and conserve the forests, but these initiatives have largely been in isolation (Singh & Nayak 2003; Singh 2003). The individual habitation are most often interested only in protecting the resources within their administrative boundaries and do not bother about the neighboring commons. In another case, the communities continue to protect the resources in their vicinity and continue using the neighbouring forest areas to meet their requirements, thereby degrading the same. Similarly, in case of water, the farmer who is extracting the groundwater is unaware about its impact on the aquifer, which caters to more than one farmer or a village. Water conservation and harvest in the uplands might be beneficial to the downstream farmers through increased recharge and consequent rise in water levels in their wells. On the other hand, obstructing the flow from the upstream might lead to reduction of the flow or non-availability of water to the downstream farmers. Thus it is therefore necessary that the larger landscape be looked at to visualize the influence of interventions. Besides the impact on the resources can be significant only if the entire landscape is protected rather than small patches. To accomplish this task the whole community around the resource needs to be mobilized in conjunction with each other based on a common and agreed upon set of rules and regulations on protection and on provision to and appropriation from the forests and common lands. The information on the whole landscape such as biomass, species, water regime and impact of the wild fire helps the community in visualizing the influence of their interventions on the whole landscape (Alison 2004). The essence of the integrated approach finds expression in the coordination of the sectoral planning and management activities concerned with the various aspects of land use and land resources. The role that spatial technologies can play in strengthening such efforts is thus very significant. The present form of resource demarcation has been done in terms of habitations/villages nested in a larger institution of the panchayats, taluka and the district. These boundaries are drawn for administrative convenience and don't necessarily integrate landscape boundaries of the river basin, forests or any particular habitat. Further, confusion lies in the fact that the responsibility of managing the resources lies with such institutions. A closer look at the various resources that lie within the boundary of a habitation reveals that certain lands are managed by the forest department, certain by revenue department, some by the panchayats while the water resources are managed by the water resource department, and the habitations have little or no control over the resources. The departments too do not have clear and a combined land use plan and strategy for the management of the resources. However at a habitation level, a properly demarcated forest confers the finest sense of security to the forest community. Tenurial confusions emerge due to a lack of clear sense of physical limits of a particular resource leading to unperceivable notions about its boundary. Forest communities have entered into vicious conflicts, both among themselves as well as with the Forest Department, in situations where the forests have been improperly demarcated. It is foremost in the course of achieving tenure that the forest be demarcated judiciously, which in itself forms a strong foundation for tenurial security. This is true both in the case of private and common property resource regimes. A well-demarcated forest area does not automatically and in itself entail a physical boundary around the resource. Experiences in community forestry indicate that instead of encircling the forest with physical barriers it is the manner in which the process of forest demarcation is achieved holds greater importance. The exercise of demarcating the forest area should take into account the historical and current relationship of the community with the resource. Forest area specification would not only establish the physical limits of the resource; it would also quantify the area for future reference and record. It may be understood that it is neither easy to change administrative boundaries nor is it possible to change the administrative structures, but it is essential to imagine new ways for managing the landscapes. This may vary from having specific plans for each identified landscape, evolve innovative institutional systems and effective supporting mechanisms to enable conservation of the larger landscapes. The Mekong River Valley project in South East Asia presents a good example that has gone beyond national boundaries for the management of resources in the river basin ( Mekong River Commission 1995 ). The spatial information helps understand the whole landscape with the administrative territories and thus can play a major role in determining how the resources can be managed effectively. Expanding human requirements and economic activities are placing ever-increasing pressures on land resources, creating competition and conflicts and resulting in sub-optimal use of both land and land-based resources. Most of the conflicts are a manifestation of greater human needs vis-à-vis the limited availability of the resources or due to limited potential of the resource (Singh 2003). The conflicts could be related to access, demarcation of boundaries or in regards to the use of the resources. As one looks at the complexity of the resource use pattern within a village and across villages, the communities have evolved transaction mechanisms depending on the availability of particular resource across the landscape. These transactions have evolved through negotiations over a long period. The norms of transaction vary across the landscape - some because of their immediate proximity to the resource, some because of the availability of particular species and/or some for their livelihood needs. As the institution matures and the same begins to reflect in the status of the resource, there is a need for the institution to develop mechanisms for dealing with issues of distribution and appropriation. The degree and nature of dependence on forest not only differ from communities to communities but also between groups within a community. A resource management arrangement needs to take into account these different needs and dependence on the resource and strike a balance between them. Such a process is invariably complex and conflict-ridden (Singh & Nayak 2003). At this stage the issue of boundary and user rights re-emerges where claims and counter claims are made which need to be addressed; the boundary remains fragile unless there are mechanisms to bring equilibrium in the demand and supply equation within and among the communities in a comparatively larger socio-political setting. The boundary remains volatile where the community does not have complete ownership and control over the resource (Singh 2003). Conflicts due to the violation of rules are more frequent; the elite begin to take control over the management of the resource; and the "weaker" or dis-empowered sections tend to lose out. The rise in the value of the resources brings in new dynamics in resource appropriation within the village or between villages; tensions arise due to different sections trying to mould or break rules to derive a greater share of benefits. Fresh conflicts have evolved with the government's decision of devolution of the natural resources such as forests and water resources. The idea of decentralization of governance through Panchayati Raj Institutions (through the 73rd Amendment of the Constitution) and programmes such as the Joint Forest Management, watershed programmes etc has brought in an element of property rights into discussion and thereby conflicts regarding who would own which part of the resource. The transaction mechanisms developed over the years of negotiations weaken because of the state imposed programmes, which talk of boundaries at the level of the revenue villages. While the programmes may be appreciated to build in protection mechanisms for areas where no management existed, they have tended to bring in new conflicts and therefore a new range of negotiations in the management of natural resources. The second level of conflict lies in the fact that there is still no consensus among the policy makers and the practitioners on defining the user rights and regimes, devolving powers to the communities; appropriate institutions etc. Irrespective of tenurial rights the communities in certain pockets across the country, more often without the support of the government officials, have over the years done well to protect and regenerate forests. They have evolved rules and regulations for managing these resources. The visible resource, their confidence to manage the resource and their historical associations with the forests have become the basis for the claims by communities on the resource. This has in several instances set the government against the communities and the ensuing conflict has become a threat to the sustainability of resources and the institutions managing the same. If, in the future, human requirements are to be met in a sustainable manner, it is now essential to resolve these conflicts and move towards more effective and efficient use of land and its natural resources. Integrated physical and land use planning and management are an eminently practical way to achieve this. By examining all uses of land in an integrated manner, it makes it possible to minimize conflicts, to make the most efficient tradeoffs and to link social and economic development with environmental protection and enhancement, thus helping to achieve the objectives of sustainable resource management. Nested institutions at the landscape level emerge when there are several users from different habitations who, based on their historical dependence on a common forest patch, may collaborate to form one user unit. Also, a number of user units may form a second level of collaboration either because all of them are located around a larger contiguous forest area or because of certain cultural links. The second level of collaboration is basically to deal with protection, forest fires and boundary related issues across a larger area. The approach ensures that the collaborators regulate the behavior of their respective members thereby reducing threats to the forest area as a whole. By participating in such collaborations, the users achieve greater balance in power equations amongst themselves, monitoring becomes easy and more frequent while the cost of monitoring remains low. Increased collaboration strengthens the element of mutual respect and recognition between user units towards each other's forest area, local institution and governance rules. Members behave responsibly knowing well that any infraction on their part may expose them to several layers of authority. The role of such institutions slowly transforms into conflict resolution and work towards more established multi-layered boundaries for ensuring stable governance of the resource. Despite the regulated use of the resources by community institutions, the resources have tended to get degraded gradually. Conservation of large landscapes requires mechanisms to bring in equilibrium the demand and supply within and among the communities. Establishing clear and secure forest tenure through a set of principles relating to resource boundary, user unit, local institutions and other operational mechanisms does not mean creating a closed system of forest management. The local institution of one user unit is just a small component of a larger system comprising many such well defined forest areas, user institutions, governance rules and mechanisms for management and monitoring. In order to ensure that the local institution does not evolve into creating isolated islands of forest areas, the users need to open up channels of communication with similar groups. Forest user groups need to collaborate on strategic matters with each other. These institutions in many circumstances feel incapacitated to understand the entire landscapes and assess the quality and the availability of the resources and therefore take effective decisions. The use of visual and spatial representations can enable the nested institutions to visualize the extent of area that they as a part of the conglomerate collectively protect and manage. The exercise would enable them to look beyond their own protected resource and those in the immediate vicinity to a much larger area that they as part of a collective are responsible for. GIS technology is now being used more widely in the management of Common Property Resources (CPR). GIS is developed from the concept of a map. A map allows relationships between a wide variety of both quantitative and qualitative data to be organised, analysed, presented, communicated and used in a way no other product can match. The database component of a GIS is a structured collection of related spatial and non-spatial information. The sets of tools ensure safe and efficient access to the data stores and subsequent display of solutions. Spatial information such as land-use, cropping pattern, geological features etc. integrated with non-spatial data provides better analysis and thereby a better understanding of the landscapes. One of the most important challenges facing natural resource managers today is to identify, measure, and monitor the cumulative impacts of land use decisions across space and time. Natural resource management is a multidisciplinary field and it demands new tools to improve and augment scientific knowledge for better management. The protection of the landscape posits a need for "means" to understand the entire resource base to take decisions effectively. GIS technology is now being used widely to assist in the management of larger landscapes in terms of forest conservation, pastures, water resource management and wildlife management. The integration of both spatial and non-spatial data allow users to efficiently and effectively make well-informed decisions using visual aids and three-dimensional (3D) models that simulate the environment. While the Remote Sensing/Geographical Information Technologies (RS/GIS) technologies in the developed countries are basic to all planning exercises, developing countries have yet quite a distance to go before such technologies can be used at such scales. The massive amount of capital required, ignorance of some of the technologies and techniques and lack of access to information together make it difficult to use RS/GIS technologies on a large scale. Nonetheless these technologies are picking up slowly mainly due to the enormity of the task at hand and the level of efficiency in planning and implementation that the application of such techniques enables. The primary contribution of RS/GIS technology to CPR research is to detect the dependent variable - the "condition of the resource", objectively, accurately, precisely, comprehensively and repeatedly. RS/GIS can integrate information on some explanatory variables such as tenure, soil condition, land-use, and proximity to towns or roads. Further, resource users could use RS/GIS as a planning and monitoring tool, and for the mapping and legitimisation of tenure. But perhaps the most important requirement for CPR research is longer time-series data that enables estimation of change in resource condition over several years and decades. Planners and resource users find that these technologies increase the apparent comprehensiveness of their planning and the apparent objectivity, reach and accuracy of their monitoring. The quality of decisions, which have wide-ranging impacts, depends on the analytical tools at disposal of the users. In a GIS, individual maps, composite maps, or spatial overlay, analyses are produced to meet unique requirements. The different layers displayed on the same map, in combinations or individually, provide the user the ability to understand the information. The distance of the habitation from the resource determines the dependence of the community on the resource. The habitations that are adjacent to the resource are more dependent on the resource and exercise more rights over the resource than the habitations, which are further away. In order to understand these dynamics neighborhood analysis gives answers to the influence of regional location to a resource and its impact to others. Both distance and direction have been used to analyze spatial relations of points, lines and area features in the common property domain; for example, effects of an intervention on the upland resources impact downstream low lands. With the help of GIS it is possible to confirm whether and how soil and moisture conservation measures implemented in the upstream would affect communities 100km downstream. Similarly, it is also possible to measure the extent of the resource, length of the stream, boundary of the landscape etc. The probability and the extent of reliability of the results are computed and tested against known models. Samples representative of each area can be acquired and compared with the simulation. Cartographic modeling and visual techniques (3D) of GIS is a common application used to present the datasets to the users/planners for understanding the resource for better management of the landscapes. In managing common property resources, the purpose is to improve the accessibility and equity of opportunities and services. GIS accommodates more sensitive configurations of economic activities and common property services. GIS capabilities for handling spatial data allow researchers to develop detailed representations and analysis of the spatial distribution of disadvantaged populations and their access to opportunities and services. GIS-based techniques for solving sophisticated and realistic location and distribution problems can allow these systems to be configured to maximize accessibility and equity. Management of forests, pastures and wildlife are critical in India , as the population is likely to exceed the capacity of the land soon. The need for integrated data gives an interdisciplinary perspective to common property resource management. Data generated from spatial analysis using visual techniques enable the communities and their representatives to discuss and come up with appropriate solutions. Importantly such visual representation also allows the member institutions of the conglomerate to understand and dialogue upon their current use and extraction patterns vis-à-vis the pace of resource regeneration. Participatory models of management for decision making enrich the regulatory process by giving information and knowledge of the sustainable use of a natural resource that would lead to more appropriate local regulations for natural resource management. All in all the appropriate application of GIS at the community level can only lead to further broadening the base of the decision making processes among the participatory stakeholder groups by contributing to a more economically proficient management regime with improved efficiency and efficacy. The process of dialogue can lead to better information and more transparency about community needs, strategies and the problems at stake. This can be analyzed further on the basis of a case study that briefly describes the above process to depict the necessity of taking technology to the community. An attempt was made to link the spatial information for an effective decision making process by the village communities protecting a dry deciduous forest under the jurisdiction of the State Forest Department and given the administrative category of a Reserve Forest (RF) in South India. The objective was to understand the supply and demand scenario of the biomass available in the RF as well as in commons and to frame strategies to discuss with the communities the conservation of the resources. Remote sensing and GIS techniques have been used in the study to enumerate the species, to quantify the above ground phytomass and to understand the extraction patterns by the communities . The dependant villages are randomly selected based on their proximity to the resources, size of the village and their economical status. The findings of the study show that there is an improvement of the vegetative cover and diversity in the RF due to the community protection. Concerns however have also emerged from the study that despite the improvement in the forest cover current levels of fuel-wood extraction, both for self use and for sale, are well above the recommended limits. Satellite imageries of different years and of the same season were used to produce the classified maps of vegetation. The existing species in the RF were enumerated considering the forest type, topography, species composition and types of microhabitats. Simultaneous field study was conducted to estimate biomass and diversity. The quantity of biomass was estimated using interpolation techniques using GIS. In order to study the extraction patterns of phytomass seven villages based on parameters such as proximity to the forest, economic condition, size of the habitation were selected and information on the extraction of fuel-wood, Non Timber Forest Produce (NTFP) and fodder through household survey was conducted. The Sadhukonda Reserve Forest in District Chittoor, Andhra Pradesh in South India constitutes the designated area for the study. The RF area is sufficiently large and compact and the period of intervention has been around six years. Of the 25 villages protecting the forest 8 villages were supported by the Forest Department since 1996. Foundation for Ecological Security (FES) worked with the remaining 17 villages since 1998. The area of the RF is 6380 hectares. Besides campaigns to refrain from injudicious harvesting of trees and setting fire to the forests, no other physical activities were undertaken by FES in the forest area during this period. A comparison of satellite imageries of December 1996 and December 2002 indicates considerable improvement in vegetative cover during this period on Reserve forestland in spite of six consecutive years of drought. The dense and open forest categories of vegetation have increased by 24% and 60% respectively. In addition the wasteland category of land has reduced by 66%. The improvement in tree cover can be singularly attributed to natural regeneration from the available rootstock. The increased green cover is mainly due to efforts of the communities at protection and self-regulation, as they have not undertaken any physical measures in most of the area. The bio-diversity indices calculated using Simpson's and Shannon-Weiner's formulas revealed that although there is a rich diversity of species, a few species such as Anogeissus Latifolia, Acacia Sundra, Dolichandrone Atrovirens, and Chloroxylon Swietenia are dominant in numbers. 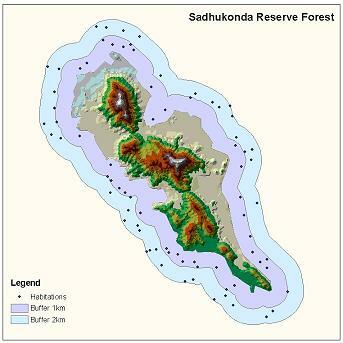 Apart from the diversity element, the quantity of aboveground phytomass of the entire Sadhukonda Reserve Forest has also been estimated as 472,315 MT using GIS. This yields an average tree biomass of 80 MT/ha for the RF. The assessment of biomass through this field study has also been corroborated through the remote sensing analysis. The extraction per annum is 8,185 MT, which is 1.73% of standing tree biomass. Literature suggests that in a regenerating forest, the maximum permissible limit is 'one-third to half' of the mean annual increment (MAI = 2.84% of standing tree biomass). Thus, the current level of extraction seems to be well above the permissible limit. 75% of the total phytomass is extracted for fuel-wood either for local use or as a means of livelihood where they sell the wood in the nearby towns. This forms as input to the communities to frame strategies to address the issues relevant to the extraction of fuel-wood and also to find alternative mechanisms to meet the requirement. The results of the study, when taken to the communities, has brought in an understanding of what has been going wrong though the communities have been protecting the resource and using the same with effective rules and regulations at the habitation level. The visual illustration of the facts using GIS has been able to generate a discussion on the management systems required at the meso level (the conglomerate of 25 habitations). Though rule making at this level is a long drawn process of negotiation within and across communities, such an intervention has definitely been successful in raising critical questions, which would have been difficult to raise otherwise. Globally GIS applications are being used significantly in areas of forest conservation, wildlife management, pastures, water resource management and climate studies but the use of the technology has been primarily limited to the use of research only. The challenge lies in taking the findings and the technology to assist communities in day-to-day decision-making processes. The field of resource management at the community level is quite complex and challenging as different categories of use decisions are shaped by numerous competing and often conflicting claims on the natural resource base. GIS could bridge the gap in information as it can combine spatial information with a variety of non-spatial variables to provide alternatives for decision-making. Most often when conflicts break out within communities and between village institutions, it is easier for those mediating to identify who is right. There is however a more difficult question to answer in such situations and that is to determine what is right. While it is necessary to know what is right, it is difficult to decide on the part of the community to assess the scale of the resource, the capacity of regeneration, the annual incremental growth of the resource and the quantity that can be extracted. As in the case study, though it may be comprehensible that the communities can manage the resources at the habitation level and have a balance between regeneration and the use of the resource, it is difficult for communities to do the same at the landscape level. The decision at the landscape level requires the meso level structures to step in - be it the panchayats, taluka or the district level officials or in some cases the conglomerates of communities (as in the case study). However such structures also fail to take up issues of "what is right" because of the lack of such information about the landscape. Taking GIS to the communities though quite a challenge both in terms of costs as well as the complexities involved with resource use is still essential. Such initiatives would definitely help in better use of the resource and protecting the critical resources that are disappearing fast, mainly because of a lack of coordinated effort at the landscape level. Ainsworth, A. (2004), "GIS Applications in Fire and Landscape Level Change: An Annotated Bibliography", GEO 565, Winter. Singh, N. M. & Nayak, P. K. (2003), Adaptive Community Forest Management: A case of Dhani Panch Mouza Jungle Surakshya Samiti, Orissa. A report on a study supported by Ford Foundation-India, Vasundhara, Orissa. Ikerd, J. (2003), "Sustaining the Rural Community Commons", presented at Rural Life Day 2003: Farming in the Sacramental Commons , sponsored by Social Concerns Office, Diocese of Jefferson City and MSR Center for Rural Ministry, Jefferson City, MO. December 6. Singh, S. (2004), "Commons in Theory: Assumed Commons in Practice". International Journal on Forests, Trees and Livelihoods , Vol.14, pp.112-120. Singh, S. (2003), "Conflicts & Disturbance - A reason to change: Lessons from Community based Natural Resource Management Institutions in Orissa, India". International Journal on "Forests, Trees and Livelihoods, Vol.13, No.3, pp.233-246.